It’s nearly impossible to not like Dale Earnhardt Jr. For those who have not been around him, know this: He is pretty much as billed. He’s as honest, as thoughtful, as profound and as genuine as millionaire star athletes come. And, I sincerely wish he would never drive a race car again. For the last several days, Earnhardt has been chatting with reporters as part of Speedweeks activities at Daytona International Speedway. And some of the chats have been scary. Tough-to-read scary. That scariness darkened the chats when the subject turns to the concussion-like symptoms that the 42-year-old driver experienced as a result of a series of on-the job wrecks and head bashings. After the Cup race at Kentucky on July 9, Earnhardt pulled himself out of the No. 88 Hendrick Motorsports Chevrolet and turned it over to substitute drivers for the remainder of the season. Earnhardt and doctors when to work rehabbing NASCAR’s most popular driver. The going was slow. He said there were times when he was 90 percent sure he would never be able to race again. The thing is, he desperately wanted to race again. It just seems really tough to imagine why. A perceived need to win a championship? To please his fans? To do right by his sponsors? To prop up an increasingly irrelevant sport? These are not good reasons. Not with all that’s at stake. The need to feed the competitive side of the man is the blanket answer you get in cases like this. In the best of athletes, that need is strong. But it should not be stronger than the self preservation. Earnhardt said he was worried that his symptoms may never go away; that he would wobble his way through the remainder of his days. The thing is, he may be just one more wreck – of his own or somebody else’s making – away from that worry becoming a reality. Brain injuries are savage. Really bad ones happen to football players who run into other football players at just 10 mph; that is, at about 180 mph less than the speed which race car drivers run into steel and concrete. Karl Mecklenburg was a linebacker for the Denver Broncos back in the 1980s and ’90s. His head took a bashing. As with thousands of other NFL players, Mecklenburg will pay the price for the rest of his life. “On a bad day, I end up places and don’t remember what I was trying to do. I’ll go out to the garage and can’t remember why I was there, what I was going to get or what I was planning to do,” Mecklenburg said in a media interview a couple years back. Head injuries have been linked to suicides in players like Junior Seau and Dave Duerson. 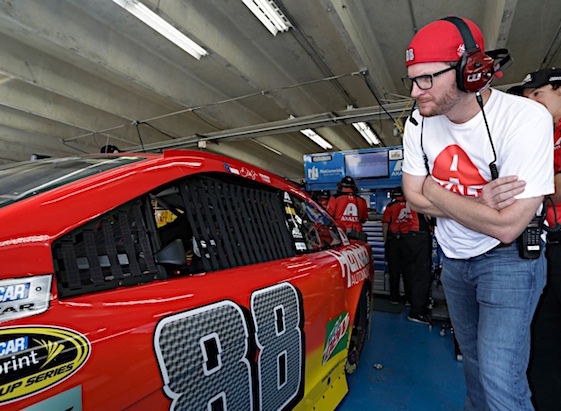 The big hope is that Earnhardt Jr. will not wreck a single time the rest of his driving career. The big hope is that he wins a lot of races. The big hope is that Earnhardt wins the championship this year and follows through on his thought about retiring after that. But by getting into a car this week and then 35 more times or so this year, my biggest hope will go unrealized.